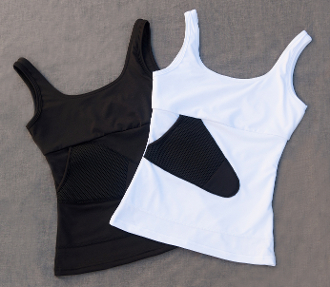 This women's holster shirt has a layer of outer mesh fabric on the pocket that disrupts the outline of your firearm to help keep a covert profile. It also has a padded inner layer on the pocket for added comfort. The pocket is positioned for a quick and natural draw. It has a unique design on the inside of the shirt to support the weight of the gun. From the outside this holster shirt looks like any other camisole!